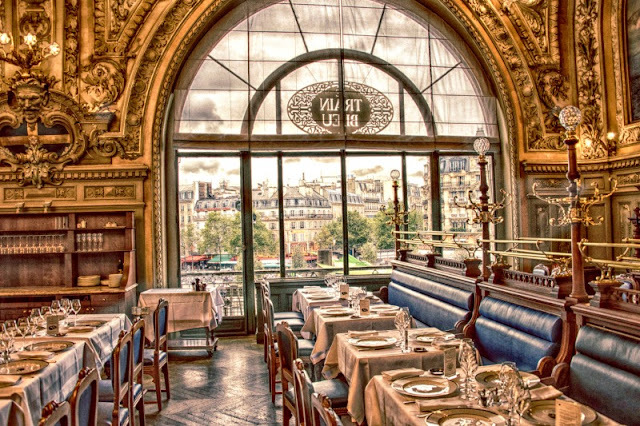 Inside the magnificent Paris-Gare de Lyon train station, you will find the regal Le Train Bleu restaurant. Yes, inside a train station! It is a curious location to find classical French food, original artwork and ambiance, all in one stop. The palatial Gare de Lyon train station built for the International Exposition - the World’s Fair of 1901, to exhibit technological progresses and expressed optimism moving into the 20th century. Paris- Gare de Lyon, located in the 12th arrondissement, on the right bank of the Seine River, is ranked third busiest train station in the French capital with trains operating from south-and eastern-France, Switzerland, Germany, Italy and beyond. Le Train Bleu was originally named the "Buffet de la Gare de Lyon”, but was renamed "Le Train Bleu" in 1963, after a luxury French night express train of the wealthy and famous, which operated for two decades before World War II. Le Train Bleu gained international fame as the preferred train by movie stars and other affluent passengers traveling between Calais and the Côte d'Azur. In 2014, Le Train Bleu received a light refurbish, reopening with a renewed sense of gleam and pride in only two months. While the interior of the Le Train Bleu restaurant is palatial – the ambiance is old world, where you speak in muted tones and dine on fine china and silver. Once you step inside, there is a magical whisper of grace and elegance from the Belle Époque style – now ready to face the 21st century and beyond. 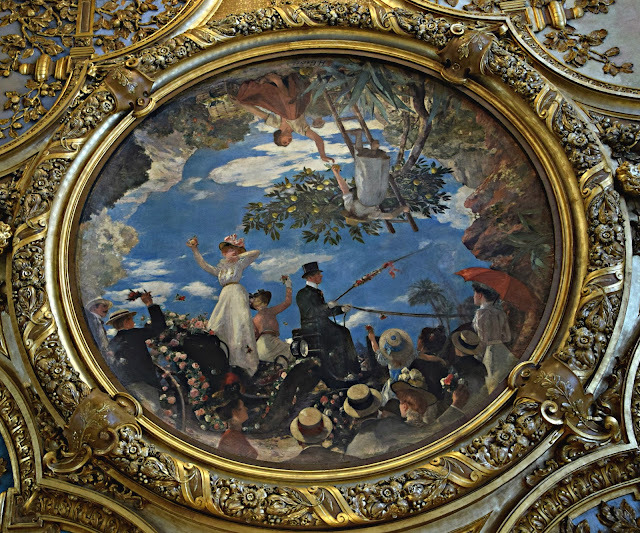 A classical French restaurant with a fine 1900’s art museum – with walls and ceiling portraying 41 European landscapes, in frescoes and paintings by the most prominent artists of the time: François Flameng, Henri Gervex, Gaston Casimir Saint-Pierre, and many others. With the accoutrements of crown moldings, gold leaf gilding, and sparkling chandeliers, all restored and harmonized, Le Train Bleu is a masterpiece just waiting to enchant the world’s traveler. Tourists and travelers from around the globe stop in this legendary restaurant, to admire the splendor of a grande dame from a gilded age.